This post has been on my heart for a few weeks, and I am finally sitting down to write it. 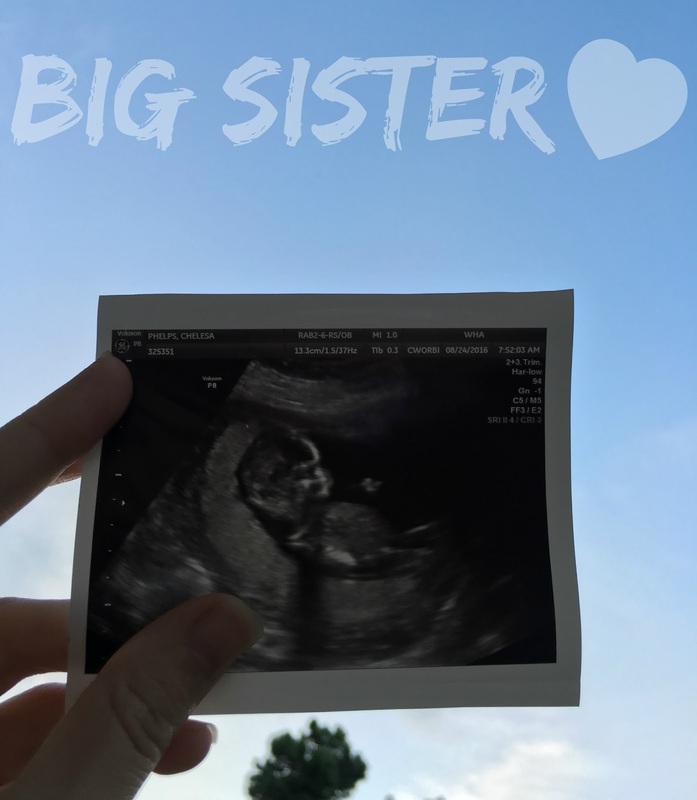 If you've been around this blog for much time, you know that the baby we are expecting in February is our second, and a baby girl in Heaven was our first. When we found out we were expecting again, a whole slew of emotions came rushing in. I was overjoyed, terrified, and everything in between. I know the immense joy that comes with expecting a child, but I also know the immense pain that comes with losing one. Would the same thing happen again? August 11th is a day I will always remember- it changed my life. August 11, 2014 is the day we found out we were pregnant with Taylor Grace, and this unimaginably hard yet rewarding journey of becoming parents started. Fast forward two years and I am 11 weeks pregnant with baby #2. I get a call from our genetic counselor with the results of our NIPT testing (early screening for chromosomal abnormalities). I just kept thinking "please please please let this baby be healthy". The screening was perfect and came back negative for any chromosomal abnormalities! It also revealed that this baby is a boy! I remember looking down at my planner an hour or so after finding out the news and stopping still. The date was August 11th. In that moment, everything felt so full circle. Tears came into my eyes, and I just couldn't believe how cool our God is. He has had a plan from the beginning, and although we couldn't always see it before, He has been faithful. He never left us, never stopping loving us, and is fulfilling our dreams of becoming parents. I'll never fully understand why God took our first baby home, and there will forever be a place in my heart that is reserved just for her. But God is faithful. From that little girl in Heaven to this perfect boy growing in my belly, He has held our hands from the beginning. Today, I am thankful for the journey. I honestly wouldn't change the past 2 years for anything. They have molded me into the person I am today and have brought me the greatest joy I have ever experienced. I love those two babies, and I thank God for the journey. This is such a touching post! I admire your faithfulness through this entire journey! You and Parker are such an inspiration!! God is so awesome! It didn't happen by chance that these two things occured on the same day of the year! Chelsea, this is so beautiful, and you're right...God has His perfect timing, as well as His perfect way of helping us heal through the hardest of times. I'm certain Taylor Grace helped send her baby brother your way in the perfect time, too. This brought tears to my eyes, what a beautiful memory. My parents lost my brother to anencephaly before I was born and I've still felt a connection to him despite never meeting him. I have faith that God will have Taylor Grace as a guide for this next little one. Keeping you in my prayers! So unbelievably happy for y'all! Congrats on your healthy baby! I hope the rest of the pregnancy goes just as well. Can't wait to read more about baby boy! This is such a beautiful post, I love it. my heart is just...full and still hurting for y'all. and hurting for the answers we just don't have. Well, now I'm crying. I am so thrilled for you guys and can't even imagine the weight that must have been taken off your shoulders when you got the phone call that everything was perfect... especially on that very date! Wow. Incredible. Chelsea, I just cried my eyes out. From one mother of heavenly babies to another, my heart is crying out in complete agreement to this post! Yes, God absolutely IS faithful! This kind of reminds me of the realization Evan and I had after our Isaac was born (our rainbow baby after three losses). We named our baby boy that we lost mid-pregnancy, Andrew Joseph. One of the meanings we found for Joseph said, "God will provide more sons." Sure enough, God gave us Isaac and Joshua. In addition to that, Isaac means "laughter," and to this day he brings us so much laughter with his quirks and funny things he says! God is SO faithful! This post gave me chills! I love how God cares about even the little details, like specific dates. It's like His little way of putting His fingerprint on it and saying, "See? I'm here, and I love you!"